The General Data Protection Regulation (GDPR) and a new (as yet to be finalised) Data Protection Act will replace the current data protection rules from 25 May 2018. As currently, the new rules will apply to the UK. Under the GDPR, you will need to audit the information you collect and hold, decide under what lawful basis the information is being processed, document the audit and have privacy notices available for persons to view which will usually be provided at the time of collecting any personal information. First we need to identify the key definitions and the lawful bases for processing data. This will help in carrying out the auditing stage and with producing privacy notices. The Information Commissioner’s Office (ICO) has issued extensive guidance on the GDPR and most of this article is taken from their guidance. Only about 1% has been used here so as not to be too overwhelming! The guidance should therefore be consulted for the full information. A ‘controller’ is the person who determines the purposes and means of processing personal data. ‘Personal data’ means any information relating to a person (a ‘data subject’) who can be identified, directly or indirectly, in particular by reference to an identifier such as a name, an identification number, location data, an online identifier or to one or more factors specific to the physical, physiological, genetic, mental, economic, cultural or social identity of that person. ‘Processing’ means any operation or set of operations that is performed on personal data or on sets of personal data (whether or not by automated means), such as collection, recording, organisation, structuring, storage, alteration, retrieval, consultation, use, disclosure, dissemination, restriction, erasure or destruction. In most cases a landlord or letting agent will be both the controller and the processor of data they hold. For example, a landlord or agent may receive an email enquiry from a prospective tenant expressing an interest to view a property. The landlord or agent is in control of the data i.e. deciding what to do with it and will also process the information (perhaps store the information in a note, database or spreadsheet). In order to process the personal information under one of these bases, you will need to decide the most appropriate basis (or bases), document why and have a privacy notice explaining to the individual the purposes of the processing. More information about processing information is on the ICO website. The GDPR sets a high standard for consent. But you often won’t need consent. If consent is difficult you can look for a different lawful basis. Consent will be needed for using any personal information for the purposes of sales or marketing for example. Consent means offering individuals real choice and control. Perhaps surprisingly, landlords or agents won’t rely upon ‘consent’ to process personal information as much as they may think. 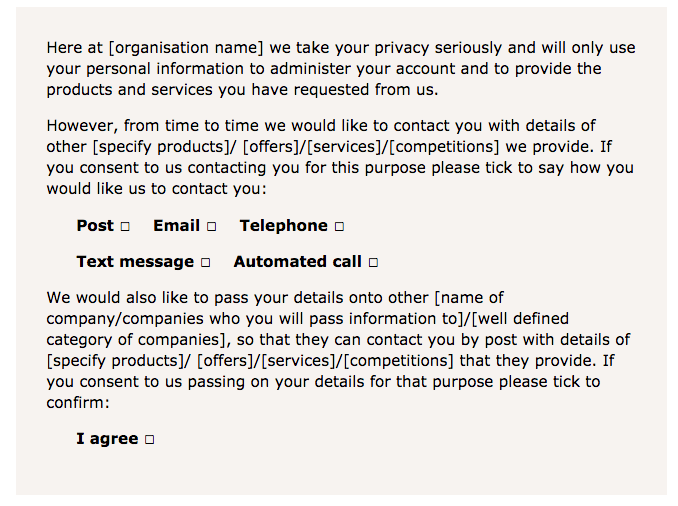 In reality, most personal information will be processed under ‘contract’ or ‘legitimate interests’. For example, if you require a credit check to be completed before a tenancy is offered, you can’t seek consent from the prospective tenant to obtain a credit check because it’s not really a choice. You must inform them that you will be doing a credit check (and everything else you will be using the personal information for) but you mustn’t mislead by suggesting they have a choice when in reality the person has no choice. Furthermore, when obtaining consent, they must be able to opt-out just as easily as they opted-in under the GDPR. This wouldn’t be of much use to a landlord or agent if they opted-in for a credit check then two hours later opted-out! As such, ‘consent’ is not the most appropriate basis for processing the data for the purpose of a credit check. More information about consent is on the ICO website. The ‘contract’ basis for processing personal information will often be the most appropriate basis for landlords and agents especially when dealing with tenants (as opposed to prospective tenants). For example, if a tenant contacts a landlord or agent about a broken down boiler, the landlord or agent will likely pass contact details to an engineer. This is necessary to fulfil the obligation to repair the boiler under the tenancy agreement. However, only ‘necessary’ information should be passed such as name, address, telephone and email. Where ‘contract’ has been decided as being the most appropriate basis for processing the data, consent is not required. You will need to document your decision that processing is necessary for the contract, and include information about your purposes and lawful basis in your privacy notice. More information about contract is available on the ICO website. Where you are required to disclose information due to some legal obligation, the processing will be lawful. An example of this would be tenancy deposit prescribed information. It’s a legal requirement to provide the name, address, telephone, email and fax of the tenant where a deposit has been received in connection with an assured shorthold tenancy. The processing of this information (collecting on an application form for example) is lawful processing because it’s a legal requirement to collect this information and insert it into the prescribed information to be signed by the tenant(s). Consent is not required to collect this information but during collection, the privacy notice should explain this basis for processing. If you are processing on the basis of legal obligation, the individual has no right to erasure, right to data portability, or right to object. More information about legal obligation is available on the ICO website. Vital interests will rarely (if ever) be a lawful basis for processing personal information for landlords or agents. It is the basis used to process personal data to protect someone’s life. Public task is for public bodies such as local authorities. This will likely be a common basis for our readers processing personal information. Legitimate interests is the most flexible lawful basis for processing, but you cannot assume it will always be the most appropriate. More information about how to carry out the LIA and what should be included can be found on the ICO website here. In addition to the LIA, the privacy notice will need to explain what the information is being used for. For example, when a prospective tenant wishes to take a property after a viewing, the landlord or agent will want a credit check carried out in most cases. This is a legitimate interest to protect the landlord’s asset. Furthermore, it is reasonably expected by a prospective tenant that a credit check will be carried out. More information about legitimate interests is available on the ICO website. The processing of criminal offence data is a tricky one because on the one hand there is a legitimate interest in knowing if a person has a conviction for arson when letting a property and so asking the question about criminal offences may be thought to be acceptable. However, it seems that asking about criminal offences will need to be stopped although we will continue to monitor this position especially when the Data Protection Bill is finalised. However, non of these apply to property lettings. As such it appears there is no lawful basis for landlords or agents to process (i.e. collect) criminal offence information relating to an individual and as such it seems there’s no point asking the question. As said earlier, we will continue to monitor and maybe seek confirmation from the ICO. Only personal information held may be processed in compliance with GDPR from 25 May 2018. Any information held that is not in compliance or has no lawful basis for processing (for example if a consent was obtained by means of ticking a box NOT to receive communication), it cannot be used any longer. As processing includes “deleting” information, the information should not be held beyond 24 May 2018. Depending upon the lawful basis of the processing, some of the above will apply (legal obligation for example) and for other bases, all will apply (consent for example). More information about the rights of data subjects are available on the ICO website here. In respect of registration with the ICO, nothing is particularly changing. The guidance at the time of writing (which is still in draft form) requires the same registration as previously. Where you have a maximum turnover of £632,000 for your financial year or no more than 10 members of staff. The fee is classed as tier 1 and is likely to be £40 per year with a discount of £5 if paid by direct debit. Most (if not all) landlords and letting agents should be registered already and will continue to need to be registered. You can use the very simple self assessment tool to determine if you need to register. the processing is for the purpose of “Property management, including the selling and/or letting of property”. If your processing (collecting or storing etc.) is entirely on paper, you must still comply with the GDPR as outlined above but registration won’t be necessary. Have in mind, if you are even texting a tenant (perhaps to arrange an inspection or for a reminder about the next rent payment) you are storing information by automated means and require registration with the ICO. The ICO has produced a “12 steps to take now” guidance leaflet and a “getting ready for the GDPR checklist” both of which are available here. In essence, you will need to document the data you process by way of a data audit and have privacy policies in place for each set of data. In practice, a single privacy notice will not be possible. In practice, most processing for lettings will need to be documented because it will be regular and similar processing. The ICO has produced specific guidance on documenting processing activities. Templates for documenting are available from within the above linked guidance (or directly on this page). With each category of person identified, you will need to decide what information you hold, under what lawful basis it’s processed etc. For example, in respect of prospective viewers, you will hold basic contact information (name, telephone , email and possibly address). You would need to decide how long you will hold the information (we suggest three to six months is long enough because they’re likely to have found somewhere by then) and the lawful basis for processing. The lawful basis of processing will be either consent (if they subscribed to the mailing list on a website for example – this will be the basis if they can opt-out of the mailing list anytime as easily as they opted-in) and/or legitimate interests may be appropriate (because they’re interested in properties and would reasonably expect you to send them information when a new property becomes available). It would not be suitable to process the information for any other purpose than providing information about new properties (unless you have consent for other purposes which should then be documented). Under the “right to be informed”, privacy notices are an important element of the GDPR. give them sufficient information to make a choice. If your consent mechanism consists solely of an “I agree” box with no supporting information then users are unlikely to be fully informed and the consent cannot be considered valid. provide a clear and simple way for them to indicate they agree to different types of processing. In other words, people should not be forced to agree to several types of processing simply because your privacy notice only includes an option to agree or disagree to all. People may wish to consent to their information being used for one purpose but not another. The ICO has produced a specific code for the construction of privacy notices. In addition, there are some excellent examples of good and bad privacy notices contained at the bottom of this page on the ICO website (and within the code linked above). We will be updating our tenancy agreement and application forms with appropriate privacy notices in due course. In summary, the starting point is to determine the categories of individuals you hold personal information on and decide the lawful basis for processing. This needs to be documented. If you hold information which does not comply with GDPR (for example, you email people for sales purposes but they have not consented), that information should not be processed beyond 24 May 2018 unless another lawful basis can be found and documented. Privacy notices should be created and a means put in place to ensure all categories of individuals see these. Ensure you’re up to date with individuals rights and think about how you will deal with requests to delete an individuals data if asked or deal with subject access requests. Check all your consents. Are they opt-in and not too general in nature? They need to be “specific and granular”. Check out the “12 steps to take now” GDPR guidance issued by the ICO. Check out the getting ready for GDPR checklist from the ICO. Will all new Guild paperwork be updated to conform with GDPR? Yes, we will be making changes to the tenancy agreement and application for accommodation. Do you have any templates to help landlords prepare their privacy notice or undertake a data audit? It feels very daunting to me! Our application form and tenancy agreements will be updated in time so you shouldn’t need other privacy notices unless you use information other than during the application process and tenancy. The audit is a bit tricky because everyone’s individual. We will give this some thought. Do I need to obtain/clarify my data storage of current tenant’s details, or previous tenant’s, in addition to using privacy notices on new tenancies/enquiries etc? The guidance says that an audit should be conducted of the data currently held outlining the categories of persons of data you hold (e.g. prospective tenants, actual tenants and former tenants) and what lawful basis the information is being processed under (e.g. legitimate interest, contract fulfilment or legally required).